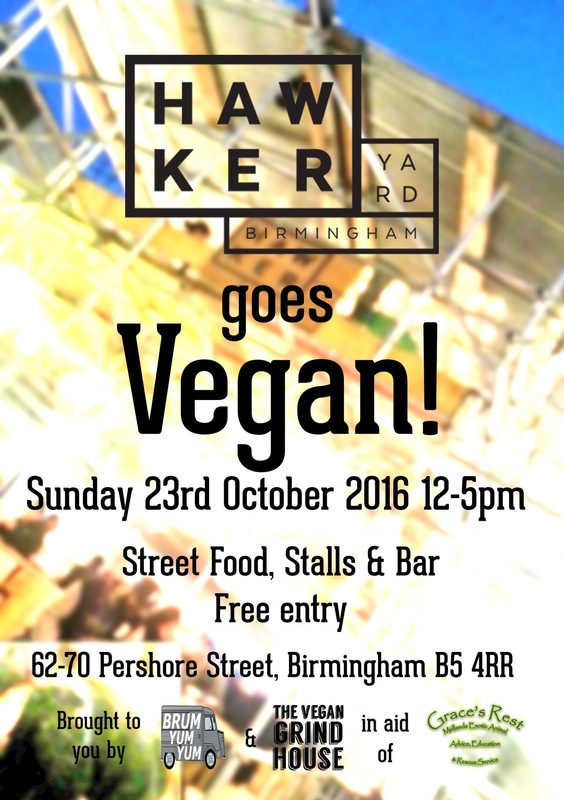 Hawker Yard Birmingham goes Vegan: Sunday 23rd October. 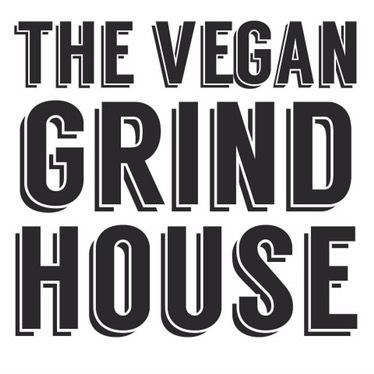 This Sunday 23rd October Brum Yum Yum and The Vegan Grindhouse by Vegan Vox are re joining forces to bring you Hawker Yard goes Vegan. The all Vegan street food event in the heart of Birmingham city centre is at Hawker Yard Pershore Street B5 4RR next to The Arcadian. 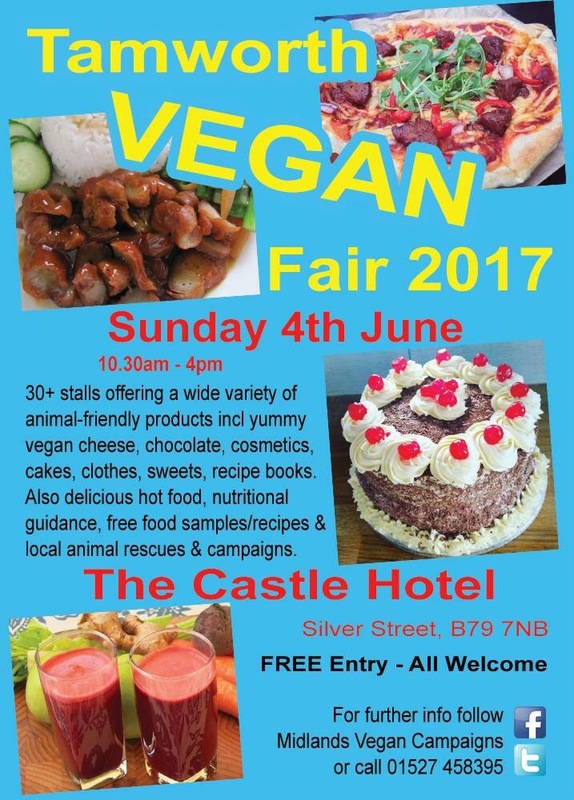 From 12-5pm, you can come and eat tasty vegan street food, buy vegan beers, wines, spirits and cocktails, meet like minded people, buy from vegan stalls and find our more about the fabulous work of their chosen animal rescue centre – Grace’s Rest who will receive a percentage of all takings on the day. 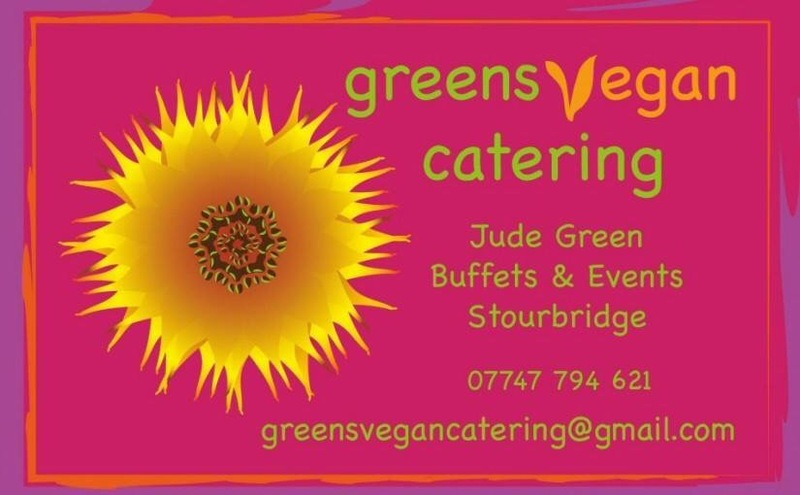 Following on from our two previous joint events with BRUM YUM YUM in Kings Heath which were vegetarian/vegan, that after campaigning this event is now all Vegan. 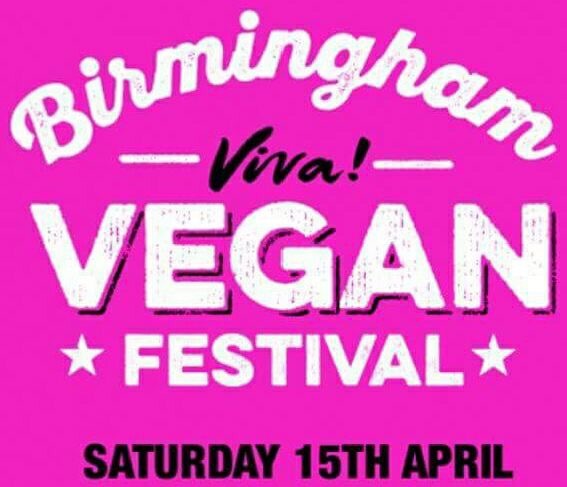 If the event is successful, hopefully a regular Vegan street food market in Birmingham will be hosted. 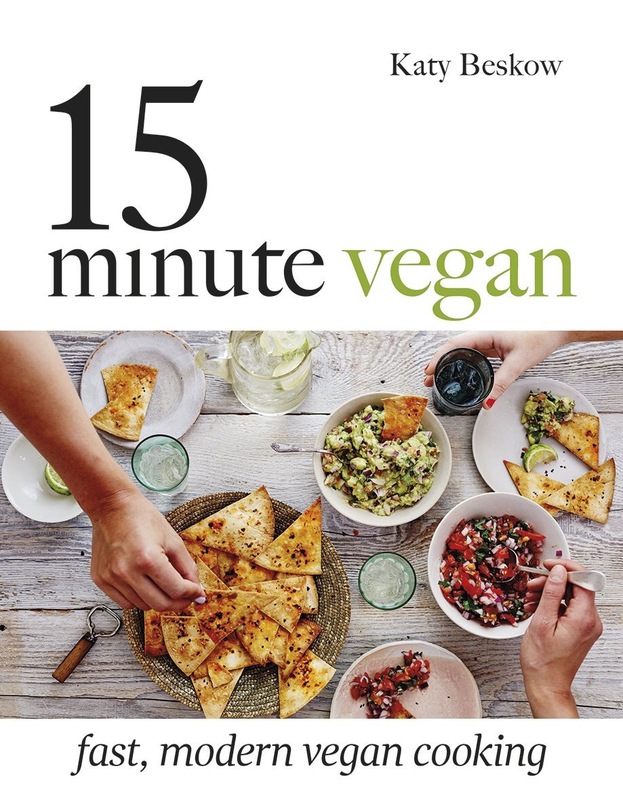 so please bring all of your friends, vegans, vegetarians and not yet vegans. Families and dogs welcome and undercover seating provided. 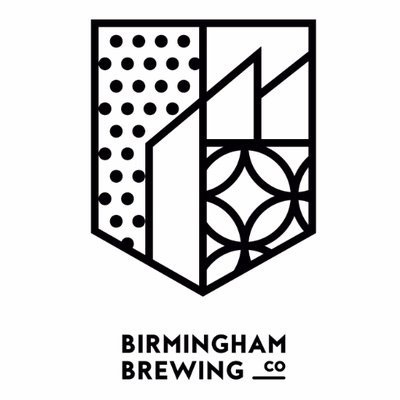 If anyone is able to volunteer on the day to hand out flyers outside the Bull Ring, in the Arcadian, Snow Hill and at Grand Central, that would be great and will be rewarded with a free meal! So support a fantastic event. 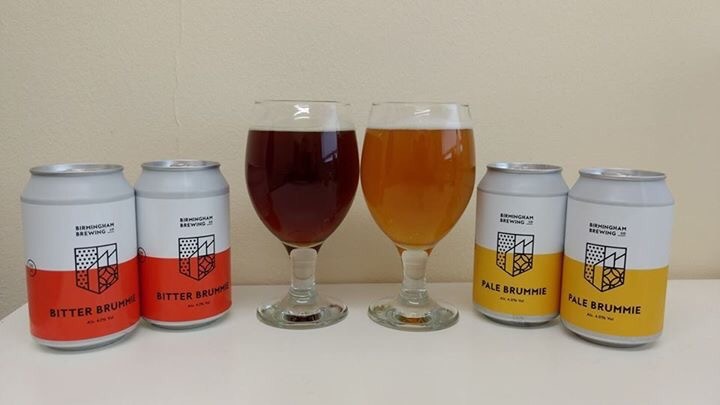 Also appearing at Hawker Yard are The Vegan Pizza company, Sri-Licious with Sri Lankan Street food, all vegan brewery Twisted Barrel ales for Vegan beer, Vegetropolis, for organic fruit, veg etc. 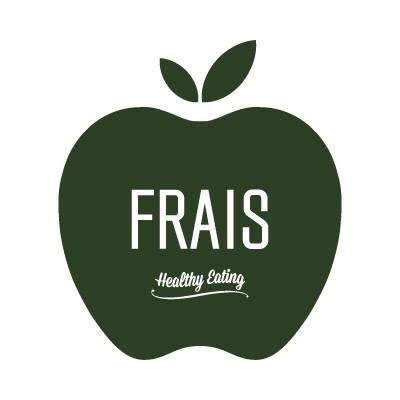 Fresh juices and shots from U-Juice, and a range of gluten free cakes and bakes and desserts and fermented drinks bar from the Gut Hut. 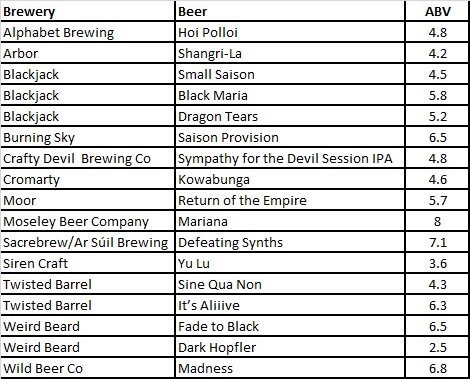 Looks a fab line up! 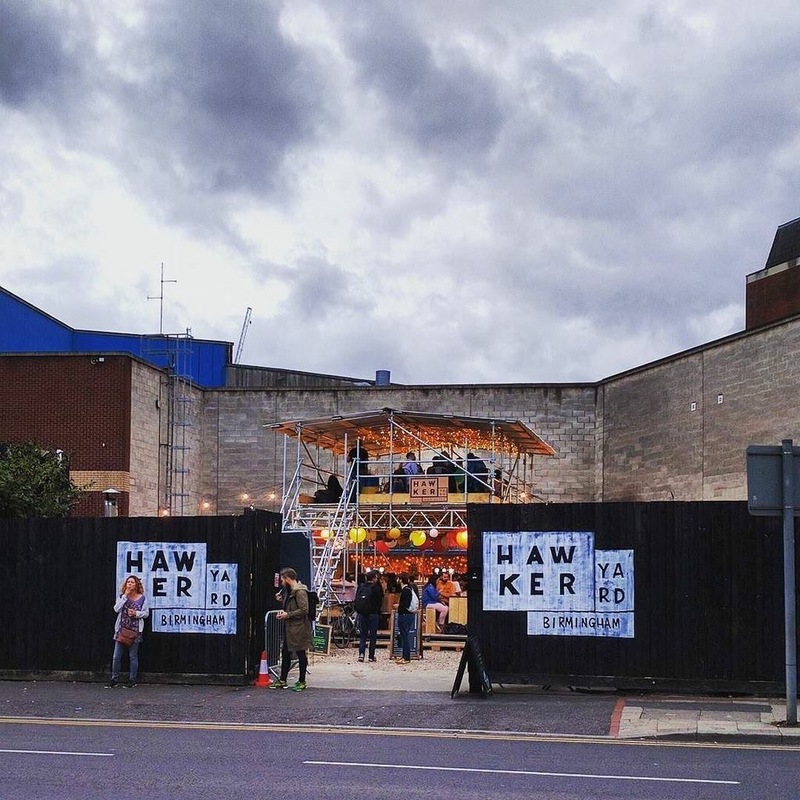 The Hawker Centre is inspired by the Hawker Centres of Asia and the ruin bars of Budapest and provides a centrally located destination where the stars of Birmingham’s independent street food scene create and collaborate. 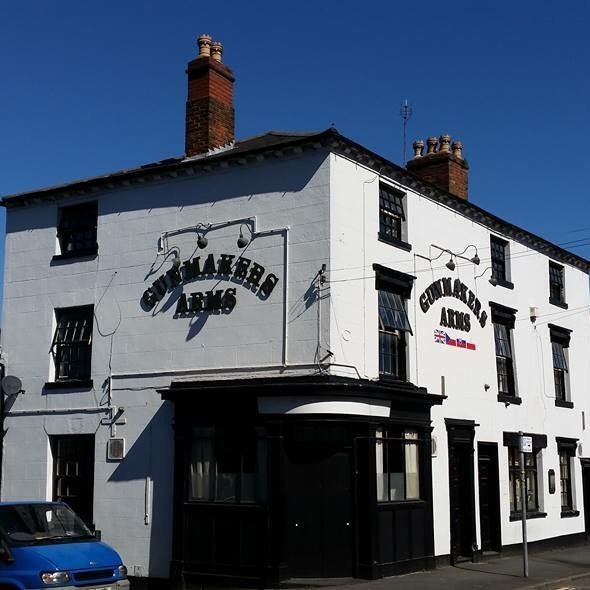 62-70 Pershore Street, Birmingham, next to the Arcadian in the City Centre. 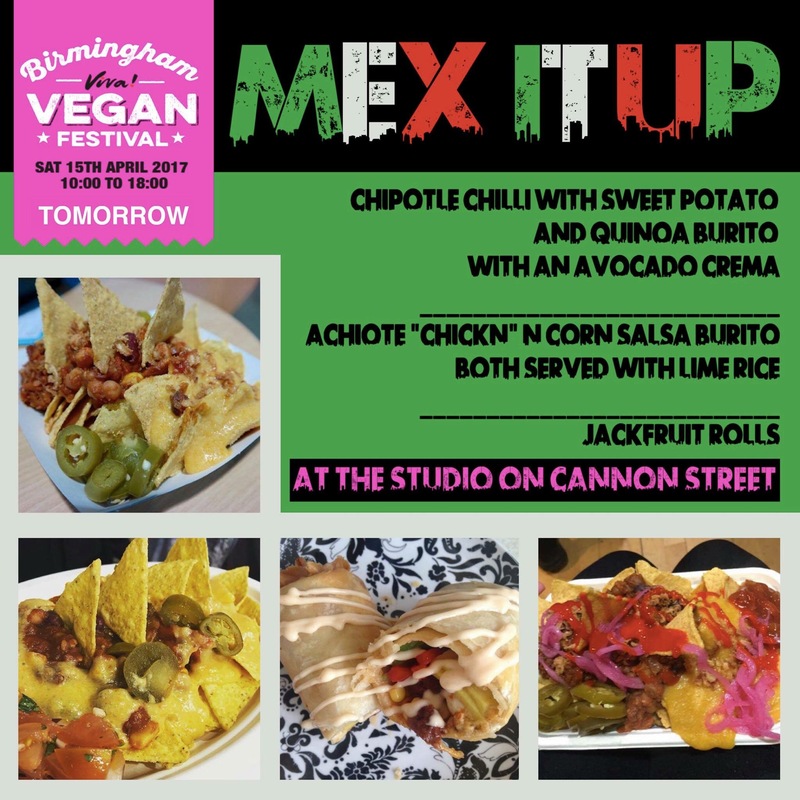 This Sunday, Birmingham’s new purpose-built street food venue serves up an all-vegan special. 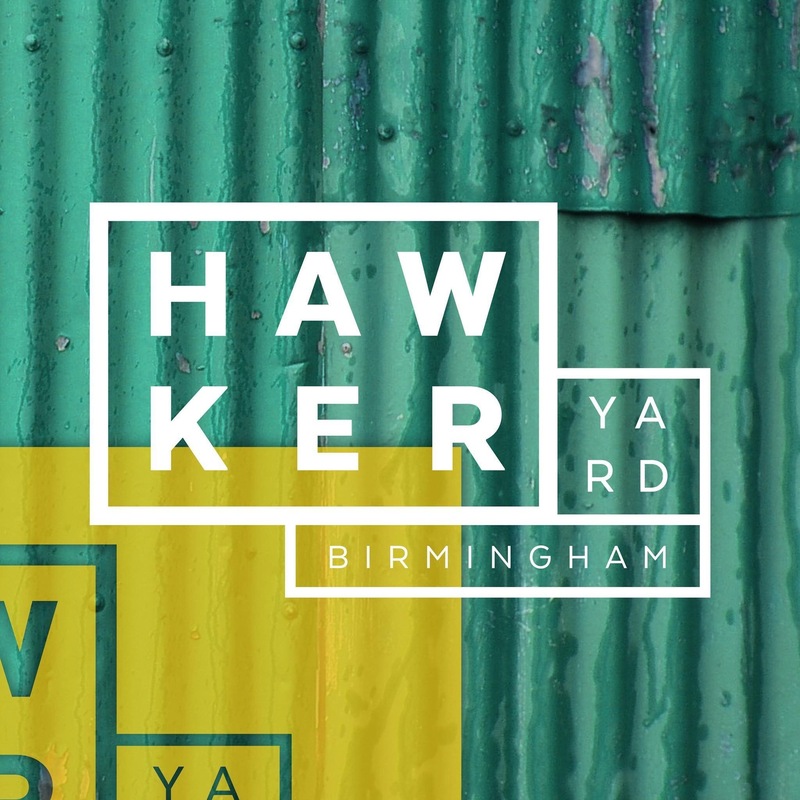 Hawker Yard Goes Vegan, the only 100% vegan street food event in the region, will feature dishes freshly cooked by leading street food chefs, showcasing entirely vegan menus from around the world. 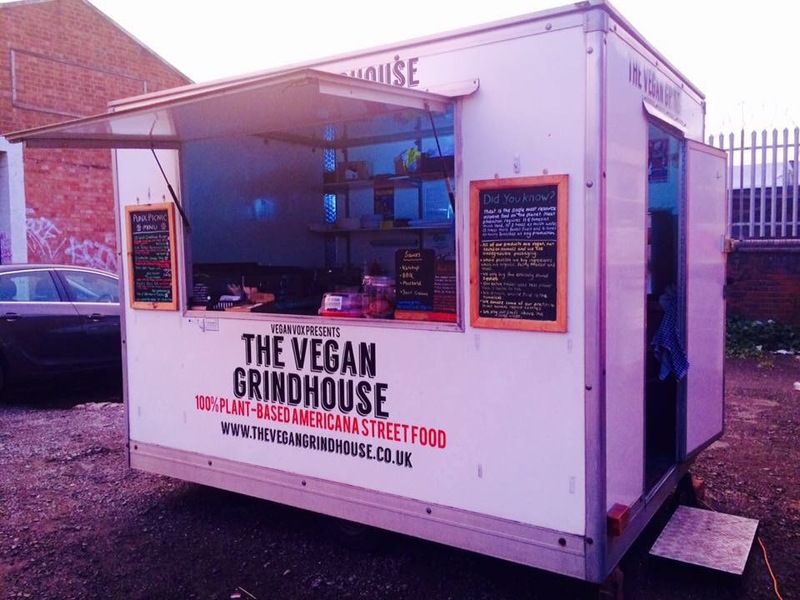 The pioneers of Birmingham’s street food renaissance are collaborating with leading Midlands street food company, The Vegan Grindhouse to host the event on Sunday 23rd October, from 12-5pm, Hawker Yard, 62-70 Pershore St, B5 4RU, next to Arcadian. 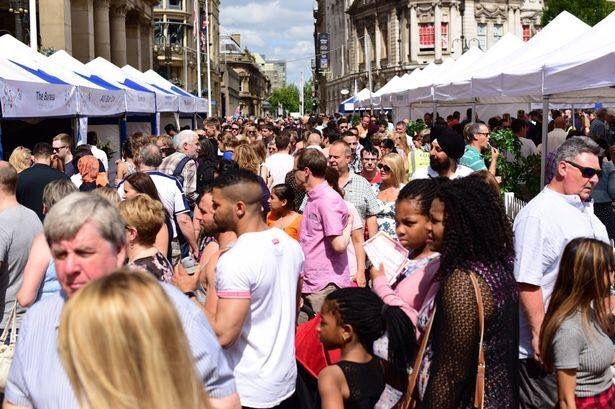 The street food lineup includes The Vegan Grindhouse with ‘vegan junkfood’ like handmade burgers and huge hotdogs; The Vegan Pizza Company; Sri-Licious with Sri Lankan street food classics, plus Caribbean, Mexican, Indian and more. 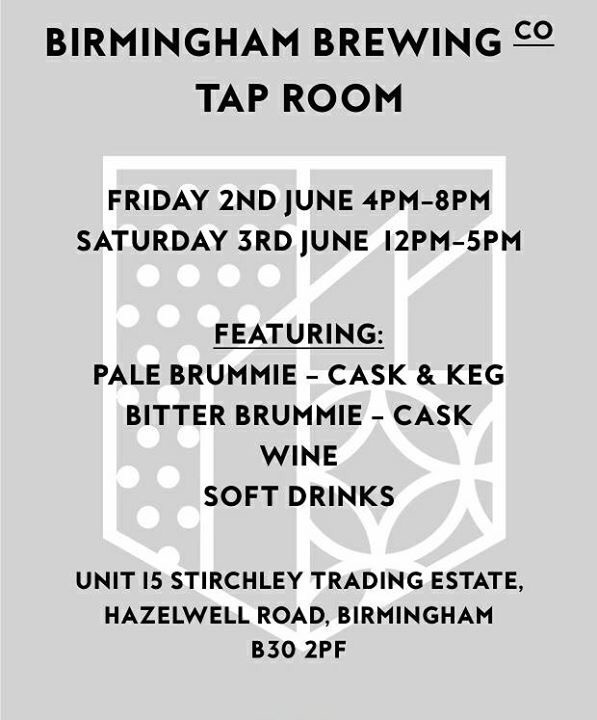 As well as all the street food, local all-vegan brewery Twisted Barrel Ales are taking over the bars, and there will be stall with organic fruit and vegetables from Vegetropolis, animal-friendly clothing and cosmetics, a fermented drinks bar from The Happy Gut Hut, fresh juices and shots from U-Juice, and a range of vegan and gluten-free cakes and desserts. The event is supporting Grace’s Rest, a not-for-profit organisation that rescues, rehabilitates and rehomes animals in crisis. So get down to Hawker Yard on Sunday 23rd October for a day of plant-based family fun at Hawker Yard Goes Vegan. 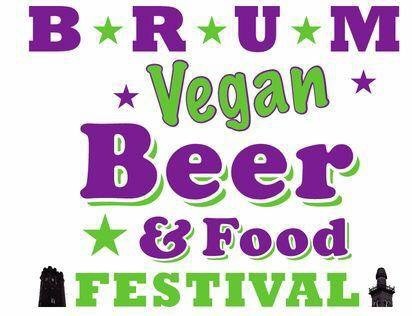 For up to date information in the run up to the event and for the full street food lineups follow @brumyumyum and @vegangrindhouse on Facebook, Twitter and Instagram. 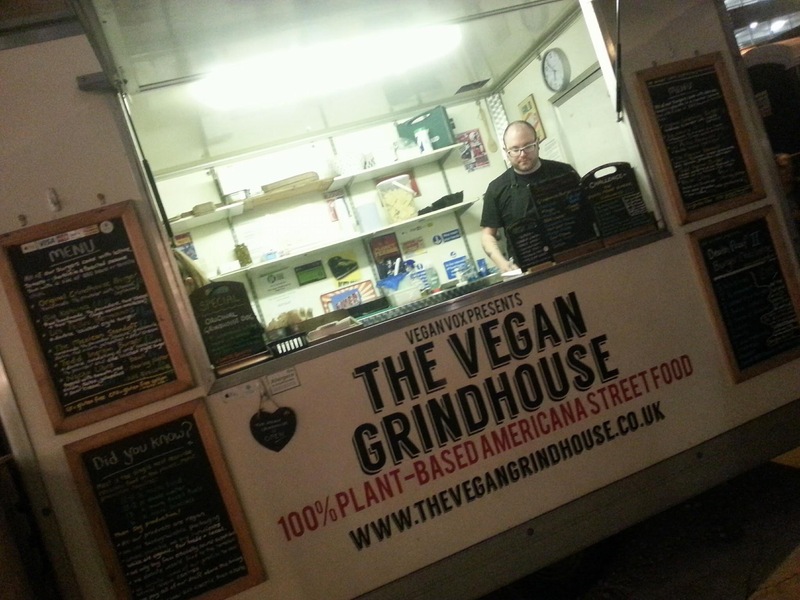 Photos courtesy of Hawker Yard and The Vegan Grindhouse.